From the early Windows [phone] app store days we have carved a niche for ourselves embodied in our “Advertise before you monetize” slogan. We believed that we can help app and game developers get to a point where monetization is feasible (for free), and then other ad networks can take over and help them make money from the same ad space. While we still believe in our mission, it’s the other side of the equation that seems severely lacking on Windows. As I described in my post on the state of in-app advertising on Windows, there aren’t many ad monetization options available to Windows app and game developers. And that is a problem for those trying to make money in the Store. Additionally, it results in a serious issue for those trying to make money in other ways (in-app purchases, etc.) but depend on advertising to attract customers into their apps – there’s just no way to do user acquisition at scale on Windows. We have been running a pilot of an ad monetization program with select apps for a few months now and it has been quite a success so far. Most apps and games in the pilot make thousands of dollars per month and advertisers got a way to extend their reach quite a bit. So we decided to extend the program to continue addressing both of the issues app developers and advertisers are facing. That said, we want to do it gradually and the program will remain invite-only for some time. However, anyone can apply. Apps and games capable of showing 10,000+ ad impressions daily. The reason is simple – we want you to make at least few hundred dollars a month. We realize that you may have several smaller apps, so this criteria is not set in stone. No “gray area” content. Some of the most popular apps, unfortunately, balance on the edge of legality and quite often cross over it. Advertisers don’t want to advertise there. We will not go deep analyzing whether what you do is legal or not, but if it feels questionable we will have to pass this time. Good ad placement. This is subjective and you may not be showing ads right now at all, but we would like to provide value to advertisers, so they are happy to continue generating revenue for you. Windows Phone 8 or Windows 10 (both Mobile and Desktop). As we want you to make money, we need to be realistic – there isn’t much demand on WP7 or Windows 8.x on the desktop. Ready to monetize your apps with AdDuplex? Apply here. We will get back to you in a few business days with instructions on what to do next. No one likes ads, but in-app advertising is extremely important to the overall health of an app ecosystem. There were several important developments in the in-app advertising space for Windows apps over the last couple of weeks. So, I thought it was important to take a snapshot of the industry and address the changes. In mid-August the first release of Microsoft Store Services SDK went live without much fanfare. There was a post in the MSDN forums, updated documentation and a paragraph in the extensive blog post on the new Dev Center capabilities. The SDK contains tooling for A/B testing, Feedback Hub launcher and an ad control (with more features coming in the future). It also introduced a breaking change: when you install the Store Services SDK it removes AdMediator from your Windows 10/UWP apps. For those who don’t know, Microsoft’s AdMediator provided a mechanism to automatically switch between different ad SDKs to maximize fill rates and revenue. This was a big surprise to a lot of developers. To be honest, I expected this to happen in a milder fashion – I thought new apps won’t be able to use the mediator, but others can continue using it for as long as the back-end service is up. In a way this is how it actually is. Except, if you want to use anything in the Store Services SDK (A/B testing or Feedback Hub) you will loose access to the Mediator. 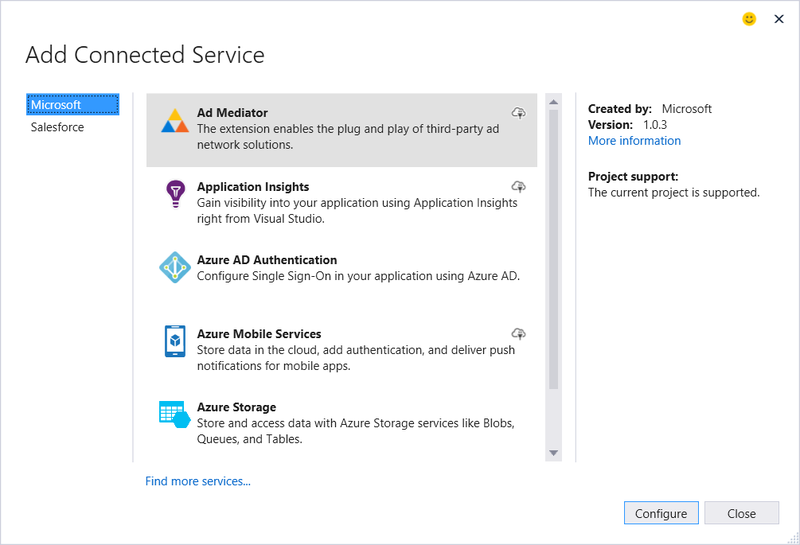 To their credit, Microsoft provides a fairly detailed walkthrough example on how to implement a mediator-like functionality in your app and continue maximizing your fill rates and revenue on the client side with Microsoft’s AdControl and AdDuplex. Alternatively, you can continue using the old AdMediator for now and use AppStretch to collect user feedback and more. While Google ignores Windows (phone) for the most part, AdMob had several Windows Phone SDKs over the years. And their latest one for Windows Phone 8 was fairly popular among developers – either as a primary ad monetization vehicle or in a mix with Microsoft and AdDuplex. It doesn’t look like they will be removing Windows Phone 8 as target platform for their advertisers. So your current apps should be OK for the meaningful time being. But if you were planning to add AdMob to your Windows Phone apps or change your implementation, you should hurry up or rethink your ad strategy. Where’s Waldo Facebook Audience Network? Back in March, at the BUILD conference in San Francisco, it was announced that Facebook Audience Network is coming to Windows. 5 months later we haven’t heard much about it, if anything. There’s still time for this to happen “later this year”, as promised. So keep an eye on it. It’s unclear if there’s any correlation, but provided Facebook has been quite active releasing and updating their apps for Windows 10 [Mobile], we can hope that they are still on track with their ad SDK. Vungle – newest, and most praised, addition to the family, Vungle delivers video ads for your Windows games and (possibly) apps. Smaato was fairly active in the early days of Windows Phone. Then it wasn’t. And now it seems that it has a Windows SDK, though I’m not sure what platforms/versions they support. VMAX (previously known as vserv.mobi) – has SDKs for Windows 10 Mobile as well as Windows Phone 8 and 8.1. From the very early days of Windows Phone 7 AdDuplex has been a dedicated ad provider for Windows app and game developers. While our primary focus has always been at helping you acquire app users and game players both free and at a higher scale, we may be able to help you improve your ad monetization as well. Send us a message at info@adduplex.com with information about your app(s) and we will get back to you with some ideas. This week only, to help you boost your Windows 10 apps, AdDuplex offers a special Kick off package ($200) and gives you 100% bonus on it! To take advantage of this bonus, jump straight to AdDuplex client area, purchase your $200 promotion package and we will credit Twice As Much to your AdDuplex account! Additionally, this whole week we are giving 100% bonus on all larger AdDuplex campaign packages. In case you want to scale up your campaigns or enjoy 2x lower CPI, don’t miss your chance! Up to 90% bonus – up to 90% more users for your great apps in February! AdDuplex is glad to announce February, a month for successful app growth, and thus this month we give all of our clients incredible, up to 90% bonus on all credit purchases for running ad campaigns on AdDuplex. This means almost two times more exposure and of course two times more users downloading your apps! In case you were hesitant about buying users for your great apps – be no more – because now is the right time to bring your apps to the top of the Windows Store! If you have any questions about the campaigns on AdDuplex, feel free to contact us at sales@adduplex.com. Any paid user acquisition activity comes with the price you have to pay for an average user that you get. It could be anywhere from a few cents to tens or even hundreds of dollars in unsuccessful attempts. 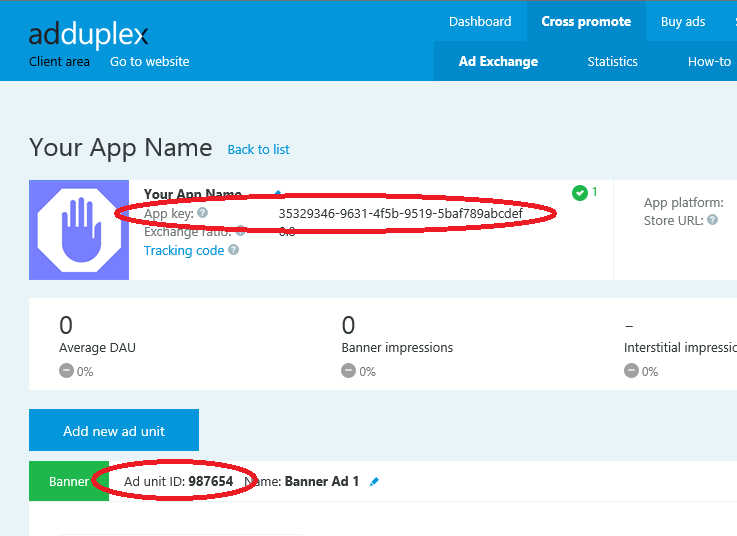 From our own experience promoting AppRaisin on AdDuplex the numbers were between $0.16 and $3.45 depending on the platform and targeting options. So, in the best case scenario $50 would buy you around 300 users. And in the average case the number would be closer to 50. Considering that those spending $50-100 on advertising would likely be first-time advertisers without extensive experience optimizing the campaign for better results, I’d venture a guess that your number will be closer to 10. If $50 is all you have for paid user acquisition, we don’t want to take advantage of you and take your hard earned money for a hardly tangible return. As we care about your success as an indie or hobbyist developer, we encourage you to use the cross-promotion part of AdDuplex or, say, participate in the Microsoft TechRewards program and redeem smaller AdDuplex coupons for the points you earn there. And you are better off spending that $50 on improving the app in some meaningful way. On the other hand, if your advertising budget is big enough to make a reasonable impact on your download numbers, we don’t want to force you to spend a $50-100 to test AdDuplex before launching a full-blown campaign. In this case we invite you to email us at sales@adduplex.com and we will give you a free trial run. Does this make sense? Please let us know what you think in the comments below or over the email. What is the ad mediation service? Ad mediation is the managing of, and arbitration between, multiple ad providers to try and ensure that the ad that will earn the app publisher the most money is shown and potential ad space is not wasted. The first solution to this problem came from the community in the form of AdRotator and it was initially very popular. Later, Microsoft released their own solution and it has now become much more common for people to use this due to its integration with the dev centre. Many developers wish to monetize their apps with advertising and it’s common for them to use ads from multiple networks to achieve this. This is because some ad networks have more ad inventory in one territory than another or are able to offer a higher eCPM for the impressions. Because of the way AdDuplex works, there will always be an ad that we can serve. This means that as long as there is a network connection we can display an ad. No other ad providers can make this claim and can deliver a typical fill rate of anywhere between 10 and 60 percent depending on varying factors including app, language and country. This makes AdDuplex an excellent option when considering ad mediation. One of the aims of ad mediation is to ensure that none of the available ad inventory goes to waste. Even if you’re not using AdDuplex as part of your user acquisition strategy it can be useful to ensure that you are not wasting your ad inventory. It’s better to show a cross promotion ad that may lead to you obtaining a new user than it is to let ad inventory go to waste. For this reason, we believe, you should always include AdDuplex as part of your ad mediation configuration. 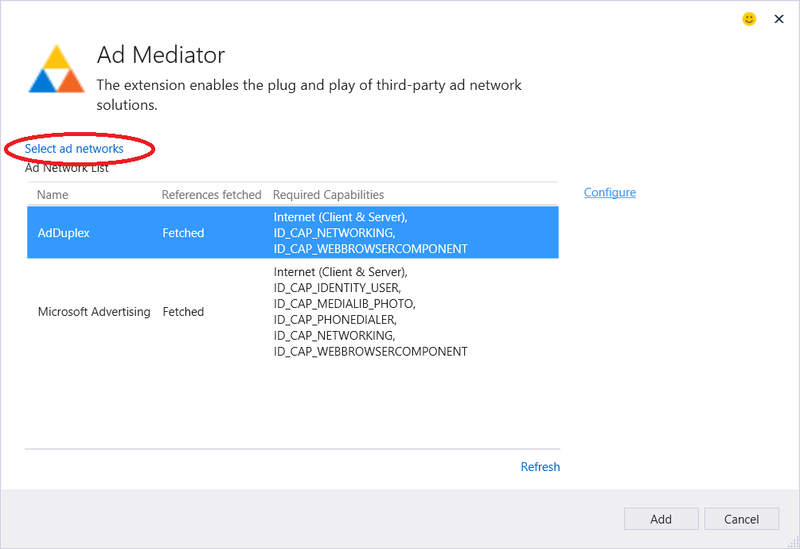 Microsoft have some good general instructions on adding and using the ad mediation control but here are some specifics around the AdDuplex aspect. If you haven’t already done so, you’ll need to register with AdDuplex. If you’re building a universal 8.1 app you’ll also need to install the Visual Studio extension. Create your campaign in the AdDuplex client area and at least one banner ad unit. Ad mediator does not currently support interstitial ads. 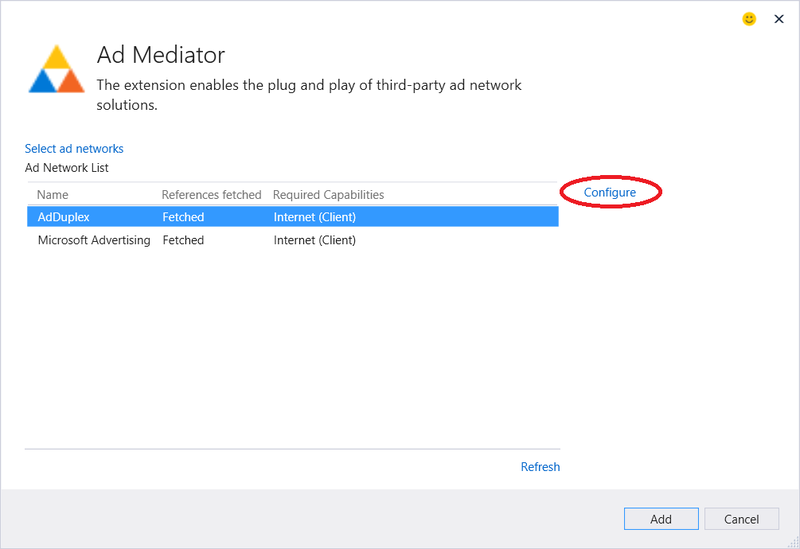 If there are multiple services available to you, select Ad Mediator and press the Configure button to configure your mediation. 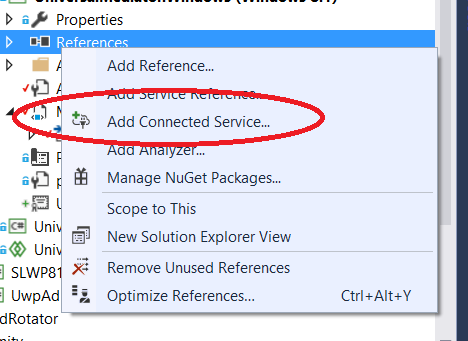 Note that connected services available will depend on the version of Visual Studio you are using so you may see something slightly different to the screenshots here. 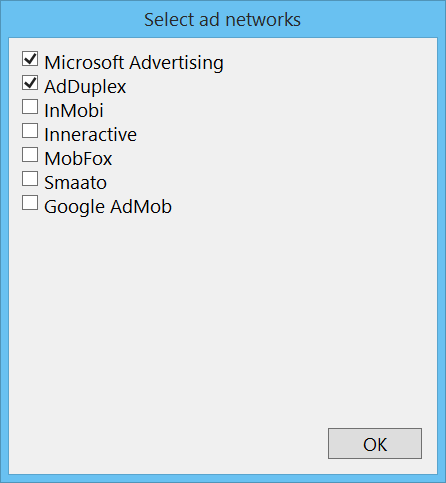 To tell the mediator that you wish to use AdDuplex, click on the “Select ad networks” option and check the appropriate box. When you click the OK button the appropriate NuGet package will be downloaded and included in the project. To configure the control/ads that will be displayed, highlight the AdDuplex entry and click the Configure link. Here you should set the values you can copy from the client area website. When you’re ready to submit your app to the store the submission process identifies that you are using ad mediation and provides a way to view and adjust the configuration. 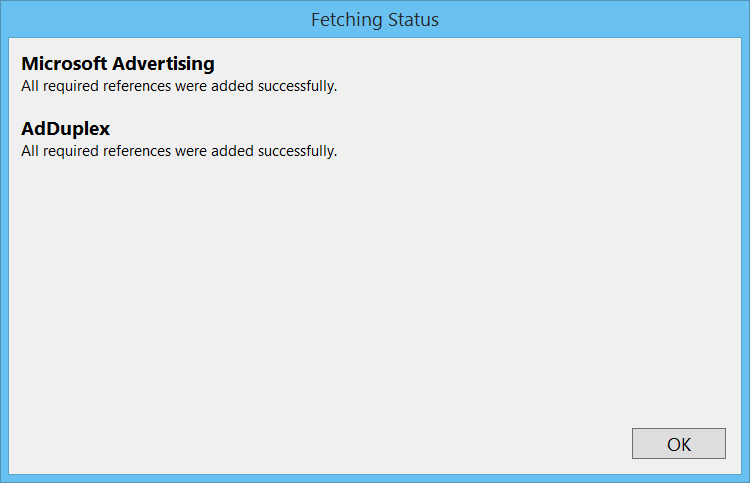 When multiple networks are specified through Visual Studio the ads are displayed in a “round-robin” fashion. That is that the mediator will try and show an ad from one network, then an ad from the next, and so on. On the website you can tailor the configuration to be much more specific about the weight you give to each network. In the above example the ad mediator is set to show AdDuplex ads 20% of the time but if we wanted to have AdDuplex ads only shown when paid ads aren’t available it should be set to backup. When settings the app key and ad unit id, make sure you set them the right way round. The app key is a GUID and is the longer of the two. The ad unit id is numeric. In earlier versions of the ad mediation control it was only possible to set the “App Id” which was equivalent to the ad unit id. That confusion should now no longer be a problem as the ad mediation configuration allows setting both values. Some people have had issues getting ads to display when running in the emulator. There is nothing to stop ads displaying in the emulator or need for a special configuration to run in the emulator (like there is with Microsoft Advertising) however, we always recommend testing on an actual device. You may experience problems with setting the ad height and width in a Windows 8/8.1 app and having it display correctly on devices with some resolutions. Just using ads with the default (auto) size and not setting the height and width of the control explicitly, should avoid this. It’s possible to set the values you need to use to configure your ad units on the dev centre website when submitting your app. We recommend not doing this and instead setting these values though Visual Studio (as above) to allow you to test that they’ve been set correctly. When configuring the ad mediator settings the AdDuplex NuGet package will automatically be downloaded and included in the project. If an update to the AdDuplex NuGet package is later released we do all we can to make sure that it will still be compatible. If you manually update the NuGet package there’s a possibility of incompatibility between the AdDuplex library and the AdMediator library. If you get errors after updating one but not the other then we recommend reverting back to a last known good state or using the version of the AdDuplex control that is installed by ad mediator. 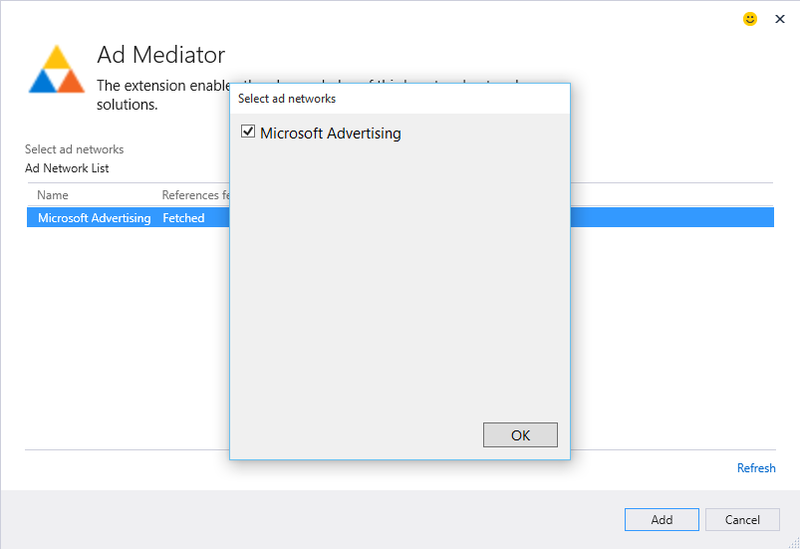 The Ad Mediator service for Universal Windows Platform (UWP) apps currently only supports Microsoft Advertising as a provider. We’re working with Microsoft to add the AdDuplex control as soon as possible but if you want to put the AdDuplex control in your UWP app now you can do this directly as we announced in July.